This charred wood material is based off a burnt damp log I found in the garden, it had been partly used as fuel in a chiminea last summer. 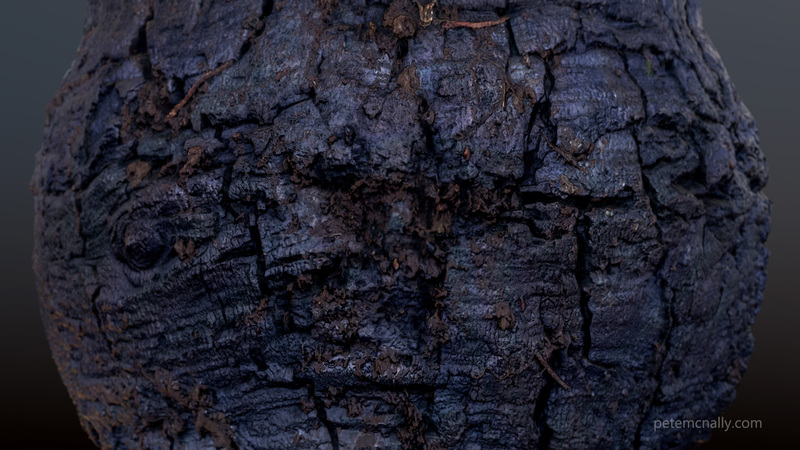 It was charred and ashen on one side, the side that was facing the ground, so it had some mud and bugs stuck on and looked great in the light of day – there was an almost iridescent effect on some surfaces of the flatter areas of the burnt “cells”. I tried to recreate it by firstly scanning the burnt end, no fancy setup, just my phone (a Samsung Galaxy S8) and an overcast day. I took about 80 photos and processed in Reality Capture, as usual. I baked down textures in 3dsmax, using Photoshop to clean up and Substance Painter to clone out missing detail. I layered in a hint of rainbow gradients in the albedo and painted a custom metalness map to help simulate the iridescent sheen on reflections. AO and cavity maps were created in Knald, which were useful in roughness and emissive textures later. 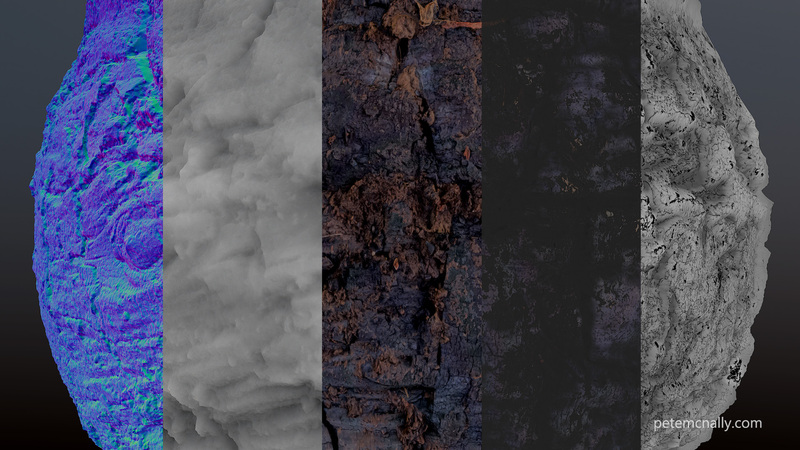 The material is rendered below in real-time in Marmoset Toolbag 3 on the stock UV sphere. 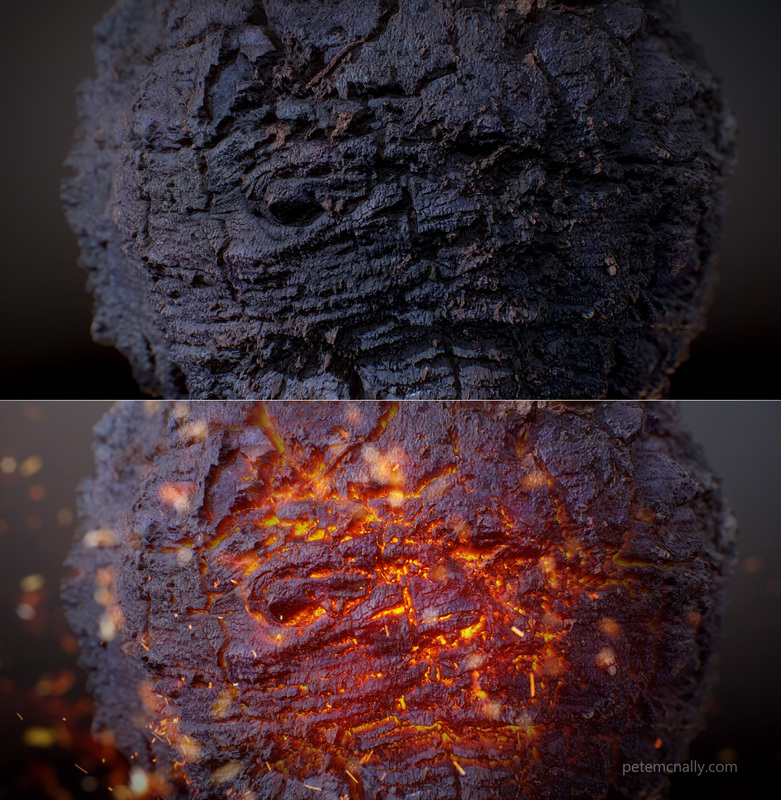 To achieve the glowing embers look below, I inverted the ambient occlusion map and used it as emissive, tinting it ornage in the Toolbag shader. Some local bloom and post FX finished off the effect. ~ by petemcnally on February 20, 2018.